At 3:45 P.M. on the 26th day of May 1917, a ominous cloud appeared on the western fringes of Mattoon, Illinois. The cloud had a black with green appearance throwing debris into the air. Within a very short time, a portion of the two prairie cities were leveled. After the storm blew through, the sun began to shine on the quiet cities as people who sought shelter began to appear to assess the damage. It was on this day that God showed his will to protect or his desire to destroy. Using historical documents and letters and descendents of those witnesses, the story of one of America's worst natural disasters is presented. WeatherCenter students and faculty advisor, Cameron Craig, will be providing forecasts for each student's hometown and Charleston, Illinois everyday. Be sure to Like us on EIU WeatherCenter's Facebook page! Cameron Craig will continue to send out the daily weather brief for Charleston, Illinois via email. If you wish to receive the email, contact him at cdcraig@eiu.edu. 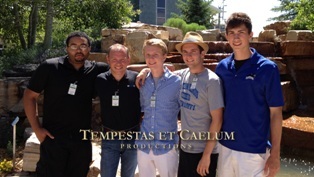 A Moment in The Whiteside Garden (EIU) from Tempestas et Caelum Films on Vimeo. Between May 18th and May 30th, five members of TCPFilms traveled 5,530 miles to learn about water resource management in the Southwest United States. Along their journey they met with water resource managers, a president of a water agency, Bureau of Reclamation public affairs person, and residents and farmers of Huron, California. The story of the members of the TCPFilms Family is an amazing one with first-time visits to new states and eye-opening first-time experiences in the Rocky Mountains and various national parks like Grand Canyon, Yosemite, and Rocky National Park. Read about their experiences on our Facebook page. EIU WeatherCenter is staffed by students majoring in Geography and declaring Broadcast Meteorology as a minor. Students go through a rigorous scientific education in order to keep the public informed of impending hazardous weather.